Menu: Family is great. Big families even more so. 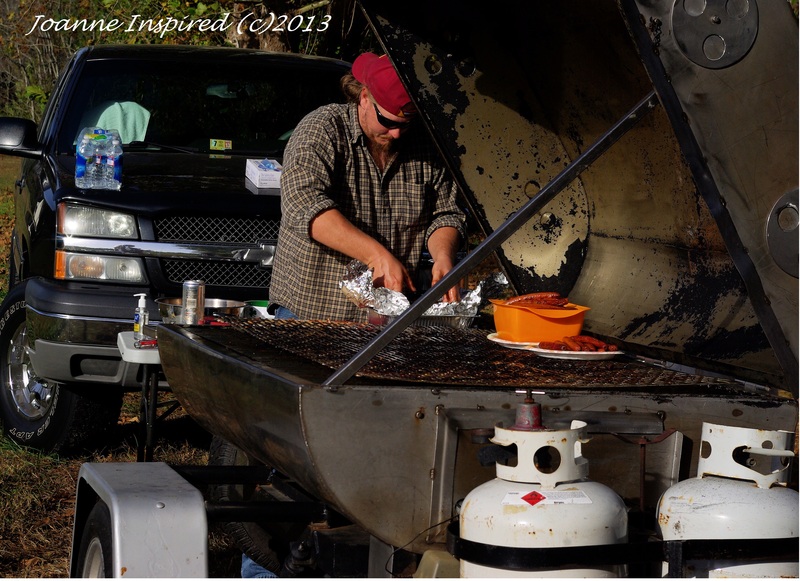 An uncle and cousin arrived in the wee hours to begin the pork roast smoking out in the field. 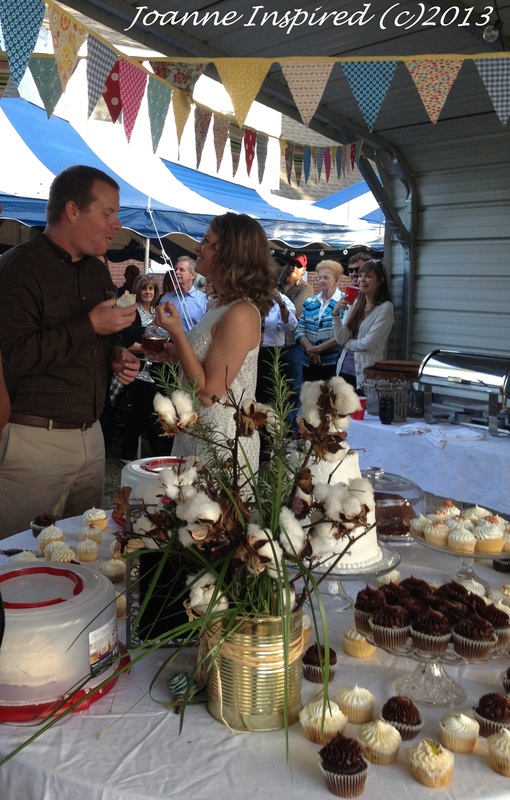 A local outfit catered the cake and side dishes. 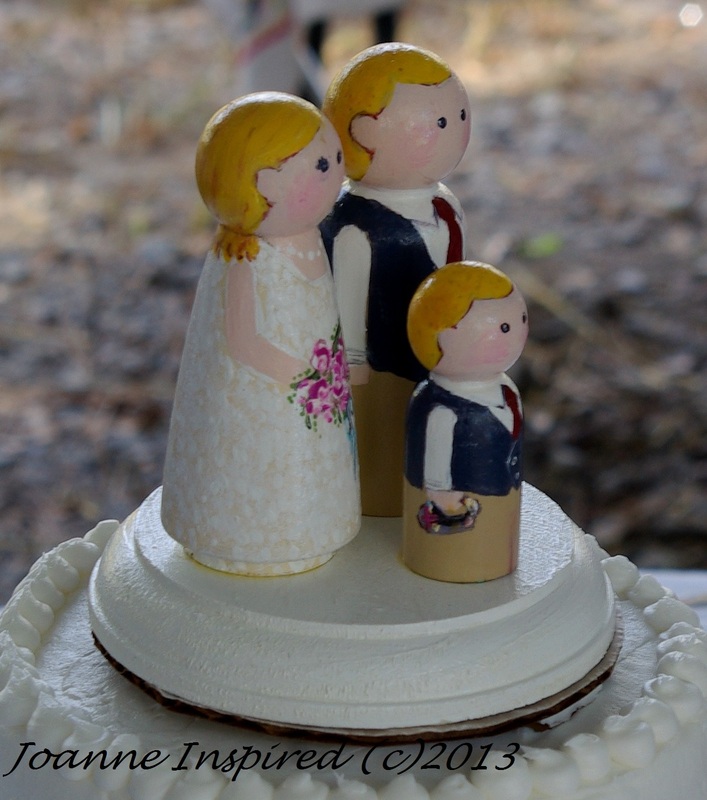 I ordered wee wood people from the Etsy shop, Goose Grease, to create a cake topper. 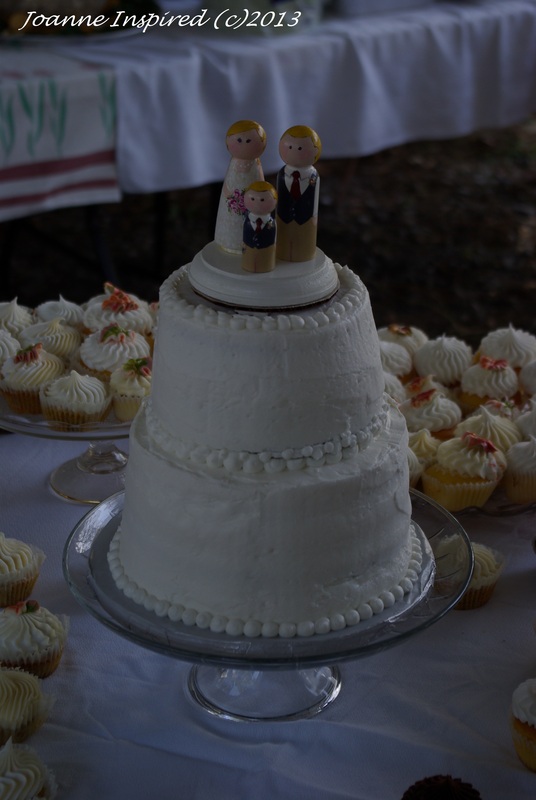 (See DIY Wedding Cake Topper here). Back Yard Flora: My daughter asked a neighboring farmer permission to cut two dozen stalks of cotton. I got up early the day of the wedding and cut flowers and herbs from our backyard. To keep the flowers fresh, I placed them in 5-gallon buckets, half filled with water. Cut an assortment of flora from your backyard – even those at the last bloom are still colorful. Herbs, ornamental grasses, wheat stalks all add filler to floral vases. Ask a local farmer permission to cut the cotton stalks left over from his harvest. The look is very unique when paired with an assortment of cut flowers. Cut and use flora as they dry on the stem (i.e. hydrangeas). 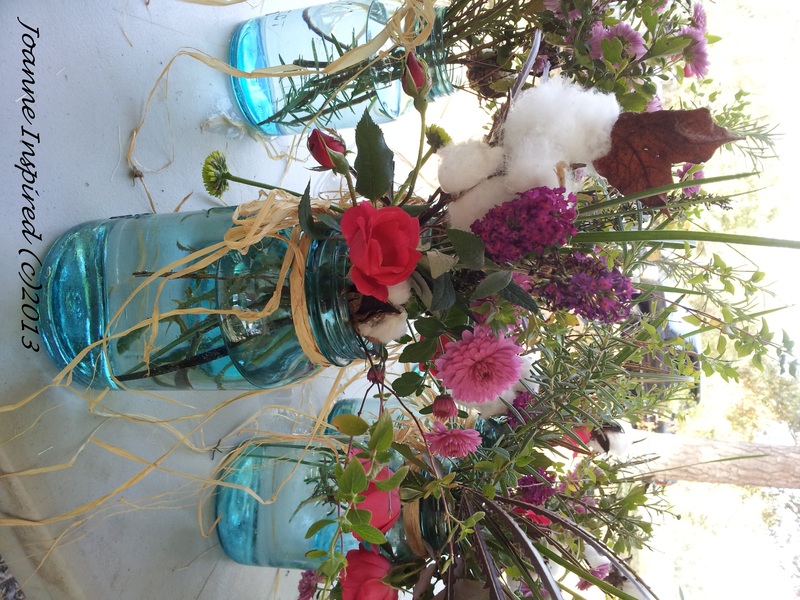 Floral Containers: We used antique aqua Atlas canning jars and vegetable and coffee tin cans. To unite them as a theme, we tied raffia around each. 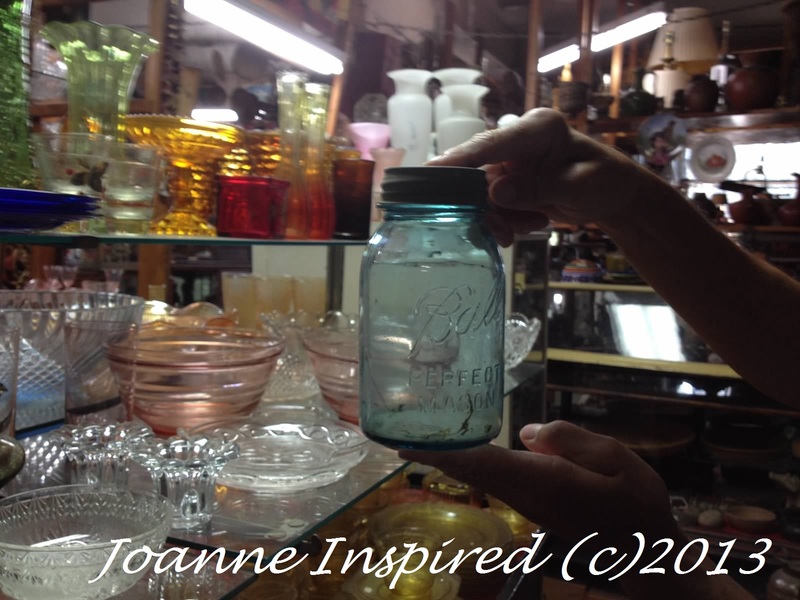 Find inexpensive antique or new canning jars and tie with raffia. Save vegetable or coffee tin cans, tie with raffia. Buy inexpensive vases from the Dollar Store. 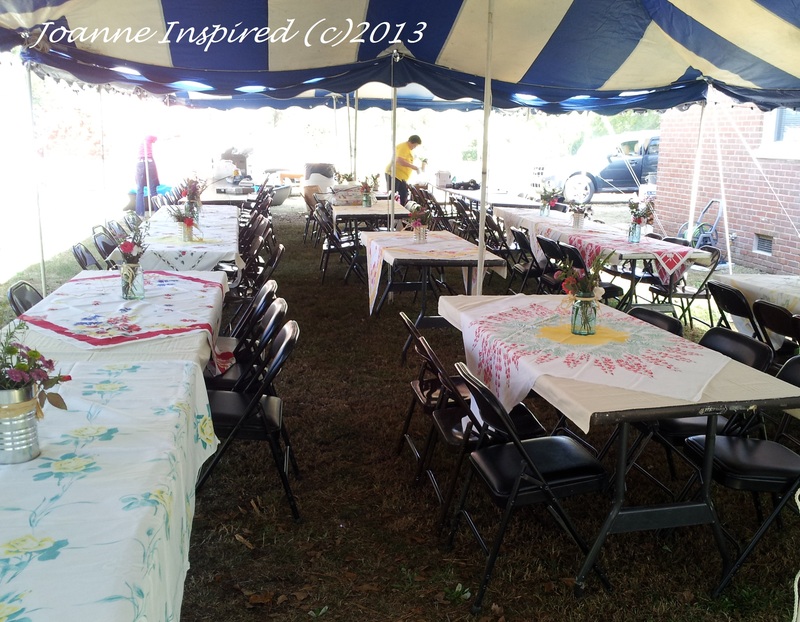 Tablescape: We used my vintage tablecloth collection and borrowed more from aunts. We placed an antique canning jar or a medium-sized tin can filled with backyard flora, a ‘kissing bell’ and two ten-hour votives in the center of each table. 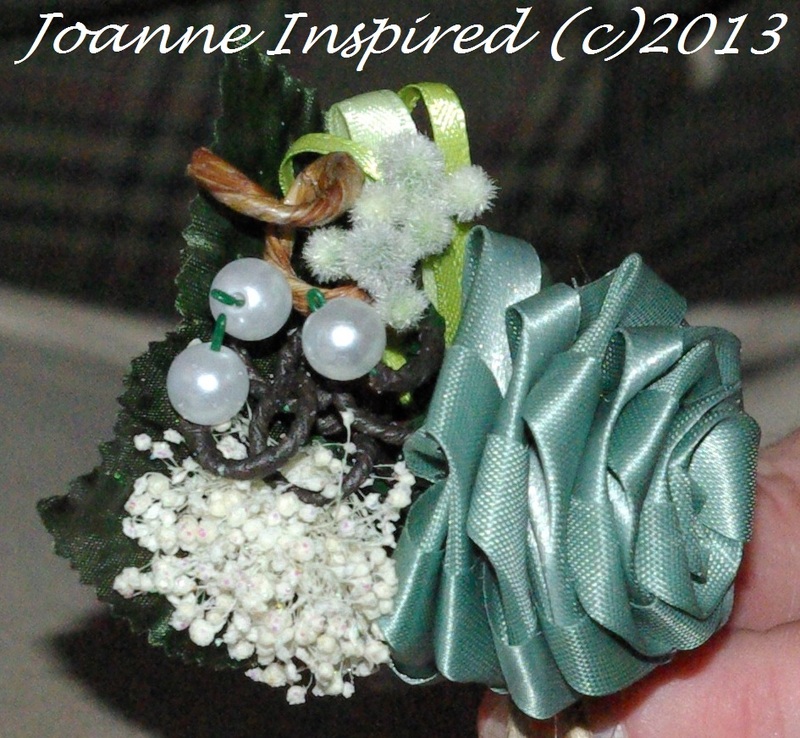 We had planned to use wood circular ‘chargers’ as center pieces, but they mildewed before we could use them. To save time and money, purchase bulk votives already in glass containers. Scour thrift stores, the Salvation Army, Goodwill for assorted ‘kissing’ bells. 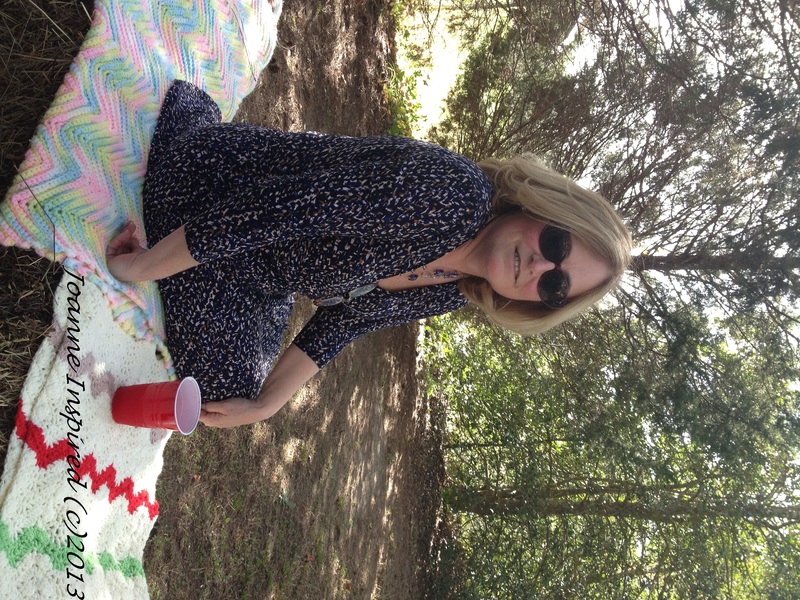 Vintage tablecloths. Don’t worry about size or color, but do look for major imperfections. Tree stump used as stools, tables, or 1-2″ tall table ‘chargers’. 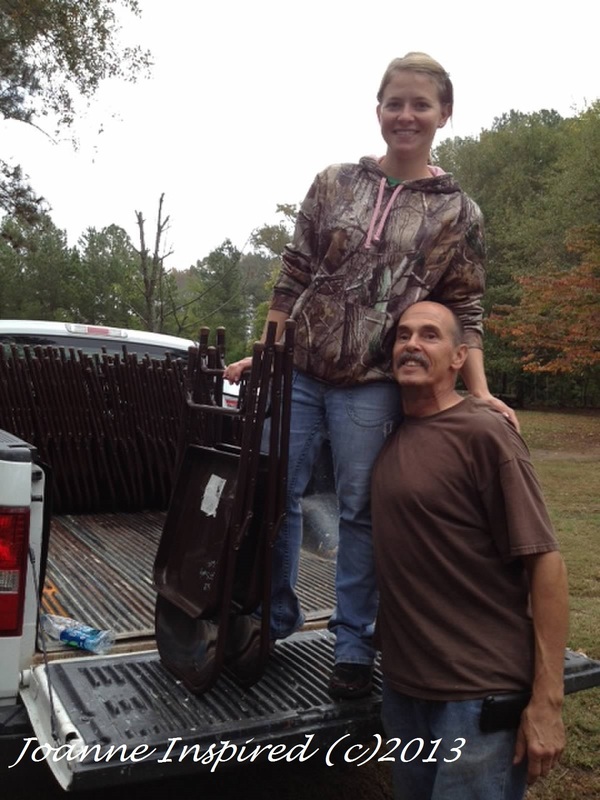 Many local tree cutting companies will provide ‘you carry’ stumps for free if they are available. We loaded our free stumps from a local park which had trimmed the trees. Scour Craigslist for ‘free stuff’. 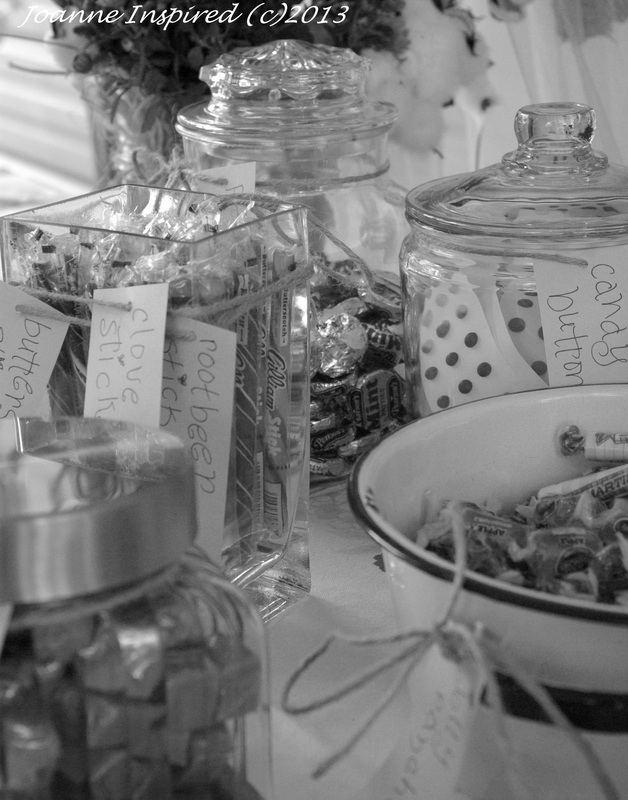 Candy Buffet: We purchased cheap Wal-Mart candy jars and ‘vintage style’ candies in bulk. 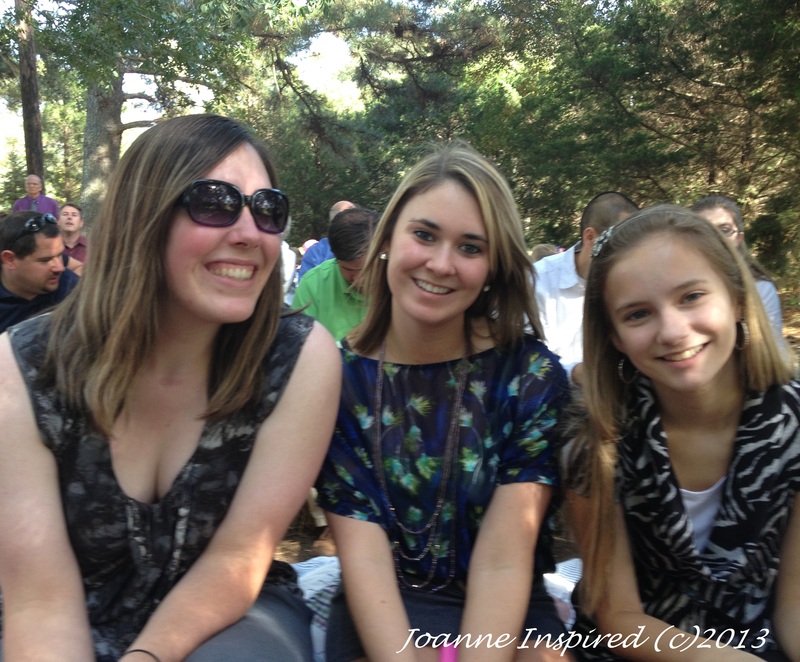 Brianne and her sister, Dylann, crafted small candy bags and placed them inside a vintage Lane cedar box that an aunt had given Brianne when she graduated from high school. Guest Book Idea: My husband painted an old mailbox with two coats of milk paint. When dried, my daughter painted, “P.S. I ♥ U” on the front. An aunt cut 8×11 cardstock into quarters, and then scalloped one edge of each with a hole punch. 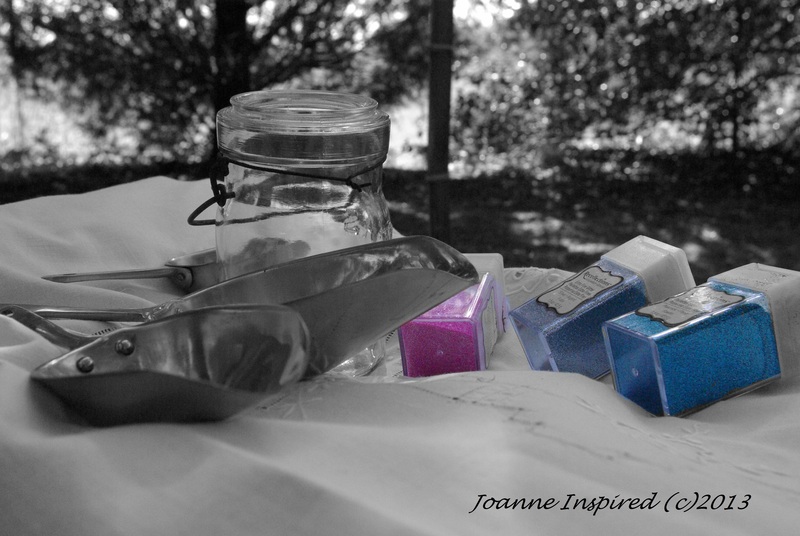 We stamped each sheet of card stock with, “Share your thoughts, well wishes and advice.” Colorful pens were left placed in an antique canning jar. To make sure guests knew what to do we printed and framed a sign. This was a B-I-G hit! Gift Cards: One of my picnic baskets fit in quite well for gift cards. 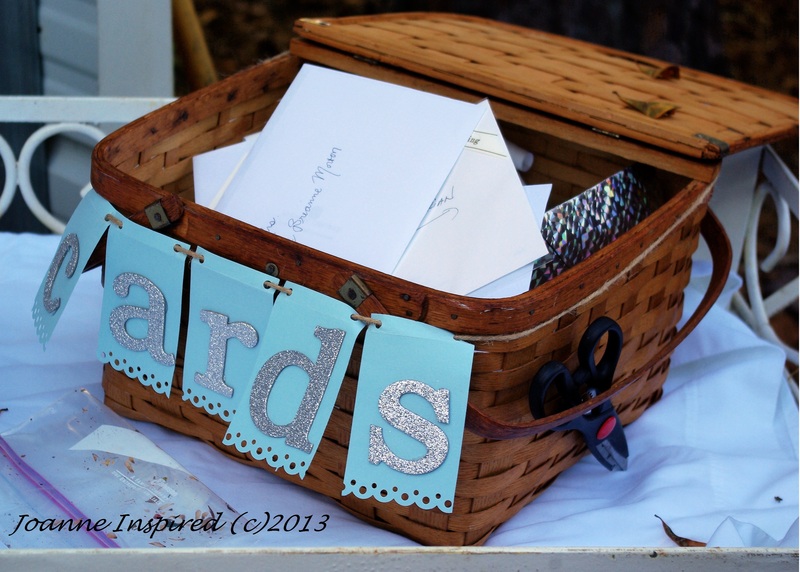 Scalloped cardstock and glitter letters were strung on twine and tied to the basket. 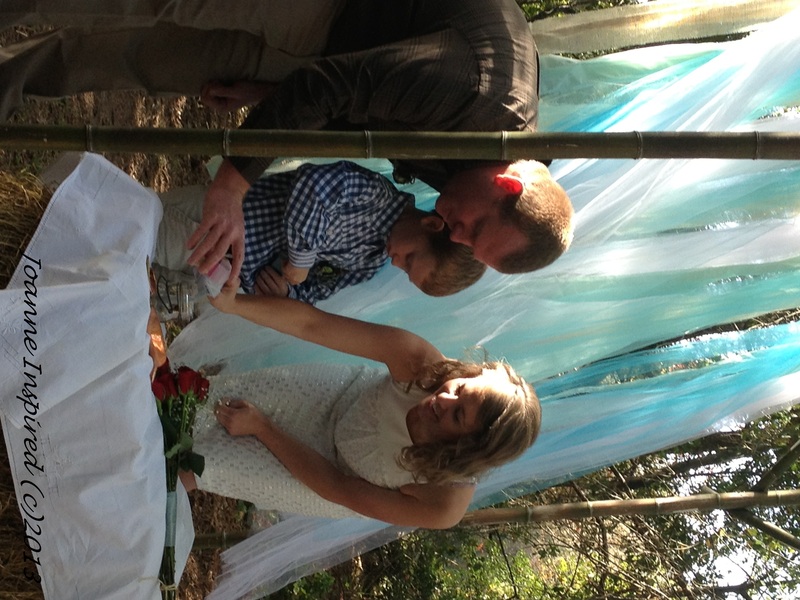 Wedding Ceremony Arch: My daughter and son-in-law cut wild bamboo and carted it home. “Dad, can you make us a ceremony arch?” Undeterred, my husband created a rectangular arch from the found bamboo. I added ‘ribbons’ of blue, teal and white tulle, blue fabric, and burlap to the back support arch. (See DIY Bamboo Wedding Ceremony Arch here). 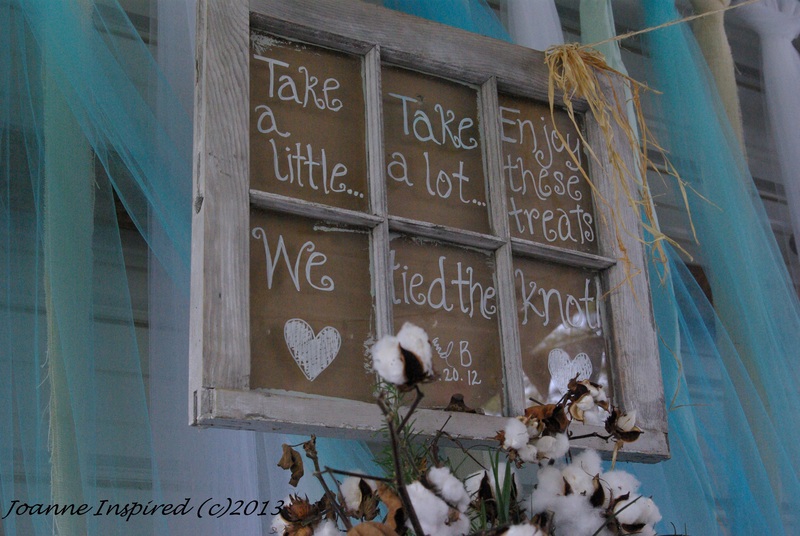 The officiate and new family used a hay stack covered with a vintage tablecloth for their Sand Ceremony table. 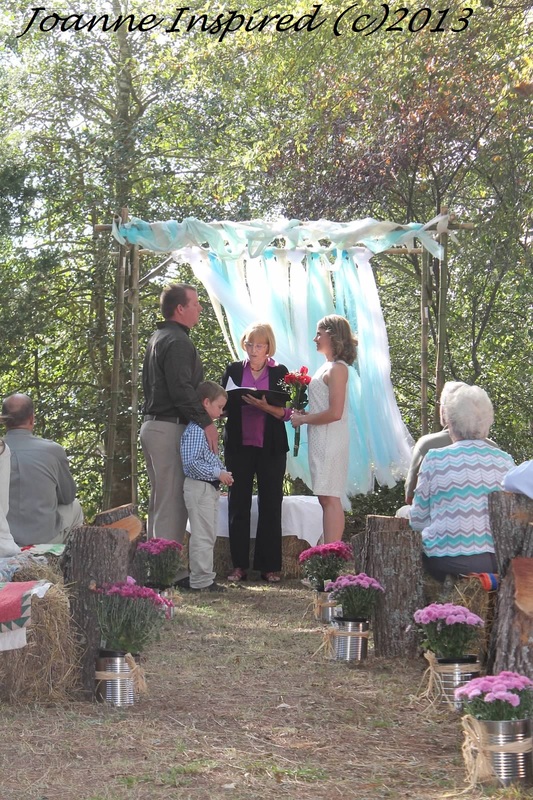 Construct a simple rectangle ceremony arch from discarded tree branches or hardware store bamboo lengths. Maybe you’ll get lucky to find wild bamboo growing out in the open country. Wrap the back top support bar of ceremony arch with assorted widths of long strips of white and colored tulle, fabrics, ribbons, and/or burlap. Wrap tulle across front support beam, hang a white baby’s breath wreath in the center. 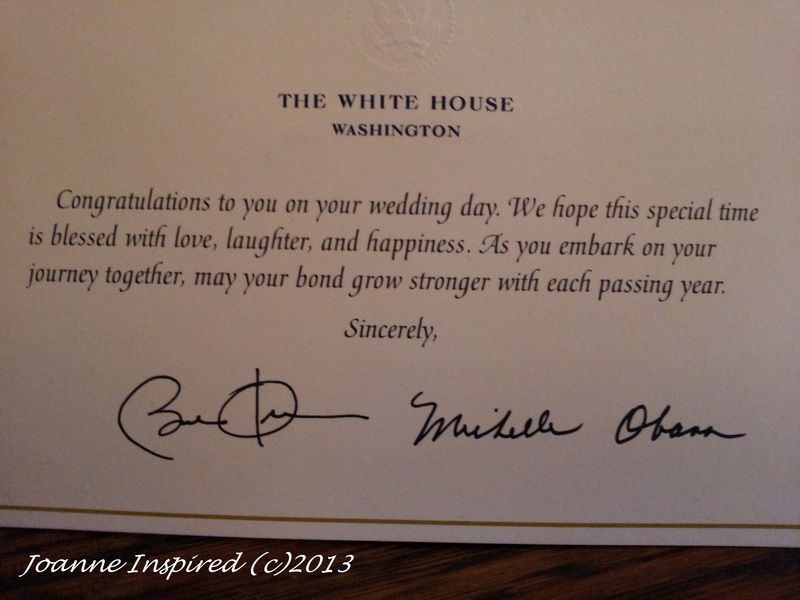 Wrap the ceremony arch top supports with grapevine or floral swags. 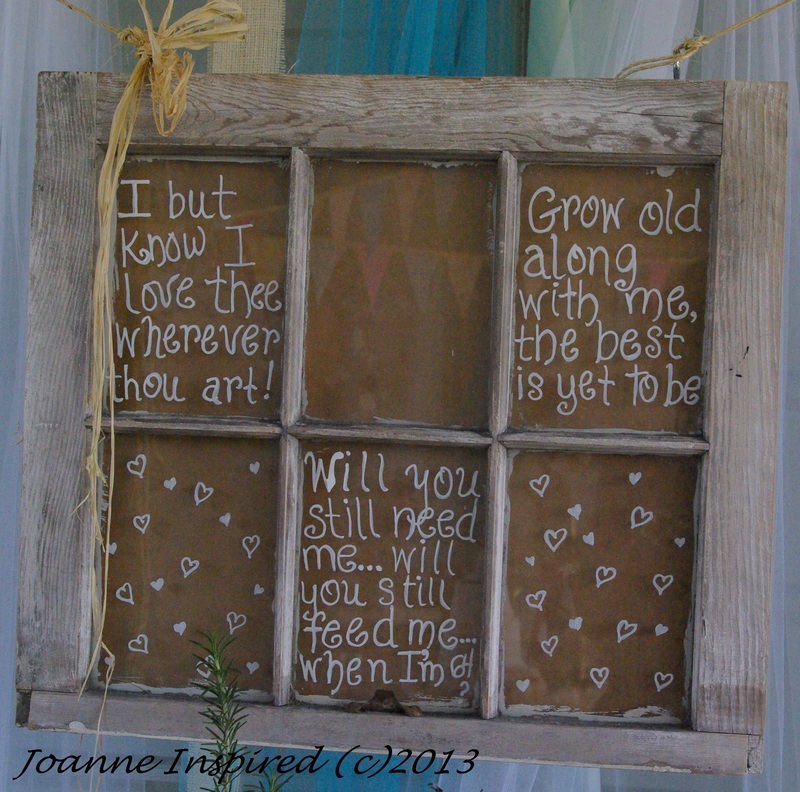 Guest Seating/Aisle: A friend of my son-in-law donated the hay stack bales for seating and decoration. Brianne and I scoured thrift stores for $2-$5 afghans and blankets for seating and decoration. 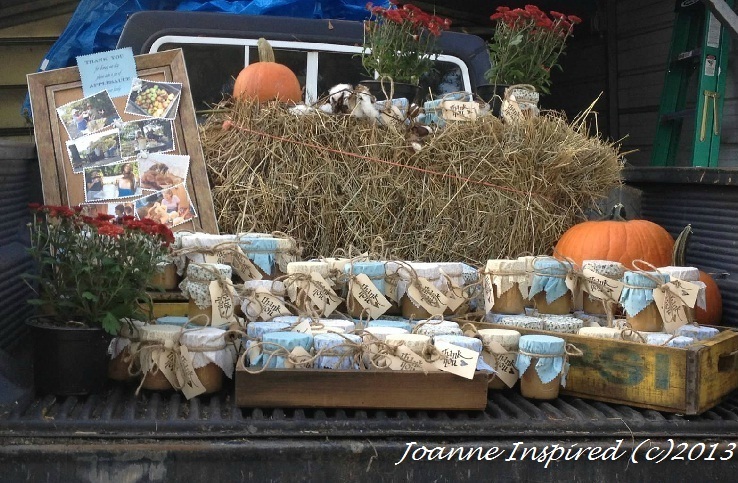 We found the cut wood stumps at a local park and used coffee tin cans filled with mums to line the aisle. 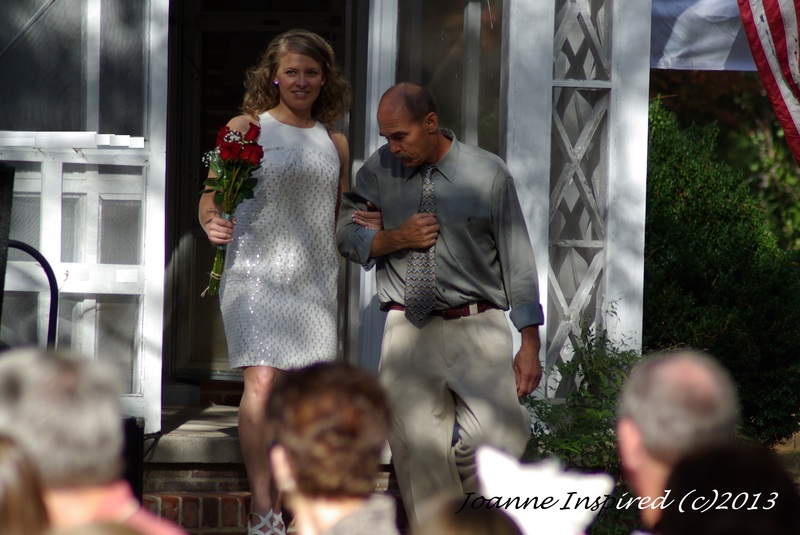 After the wedding, the mums went into the ground. 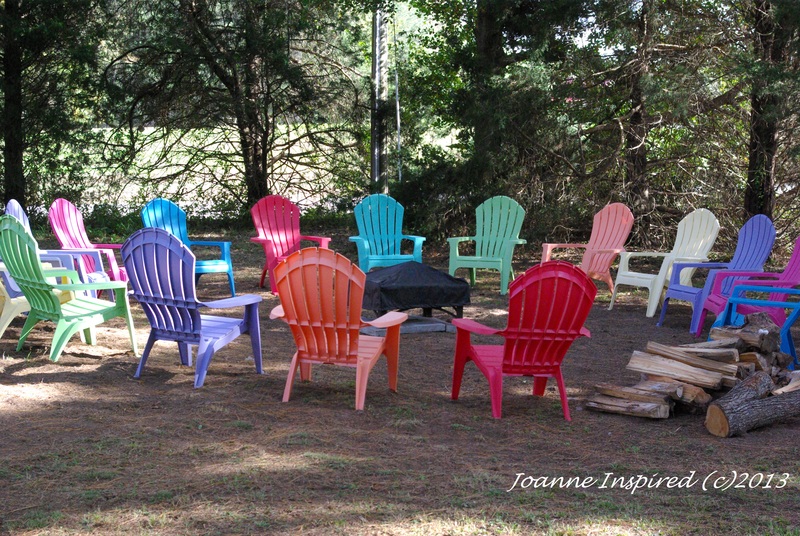 We also used colorful Adirondack chairs and stumps around the fire pit later in the evening. Hay versus Straw bales. Use straw (a byproduct of harvest) instead of the more expensive feed hay. Cover bales with thrift store afghans, quilts, blankets, and/or vintage sheets. Spiff up a basic metal folding chair by tying a simple colorful tulle ribbon onto the back support. 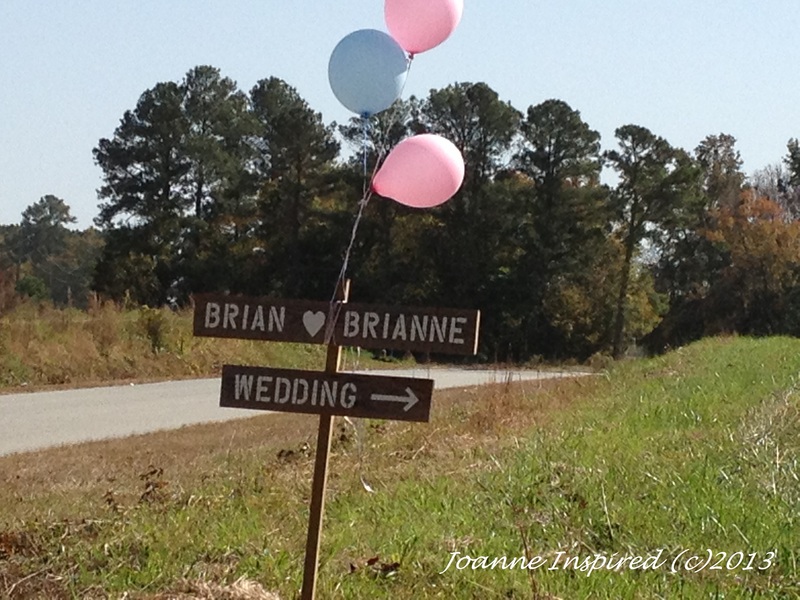 Tree stumps can be used as end aisle markers, stools, or tables. Many local tree cutting companies will provide ‘you carry’ stumps for free if they are available. We loaded our free stumps from a local park which had trimmed the trees. 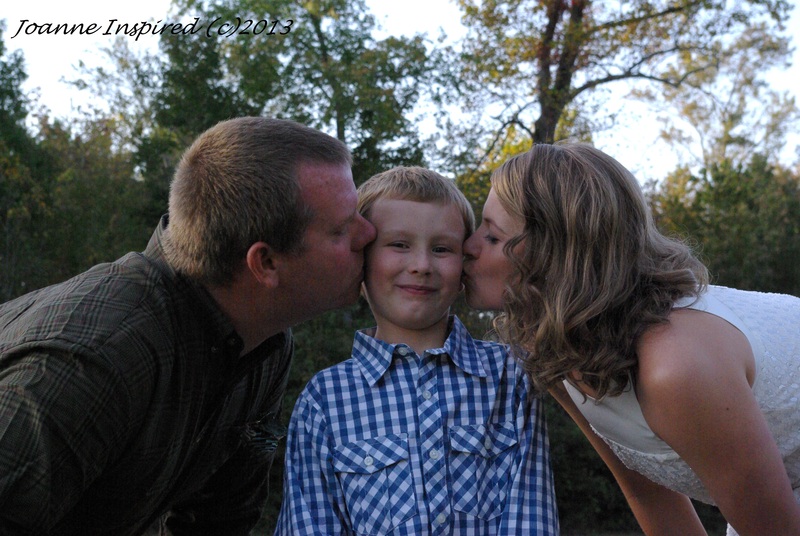 Photography & Music: An aunt recruited a friend and amateur photographer, planning to return the favor. 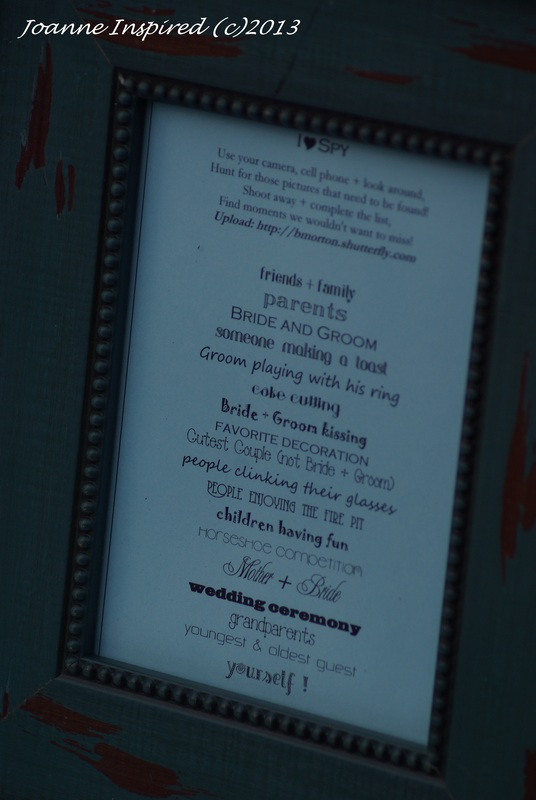 We gave the photographer a list of ‘must have’ photos of this special day. Use an iPod DJ or ask a friend. 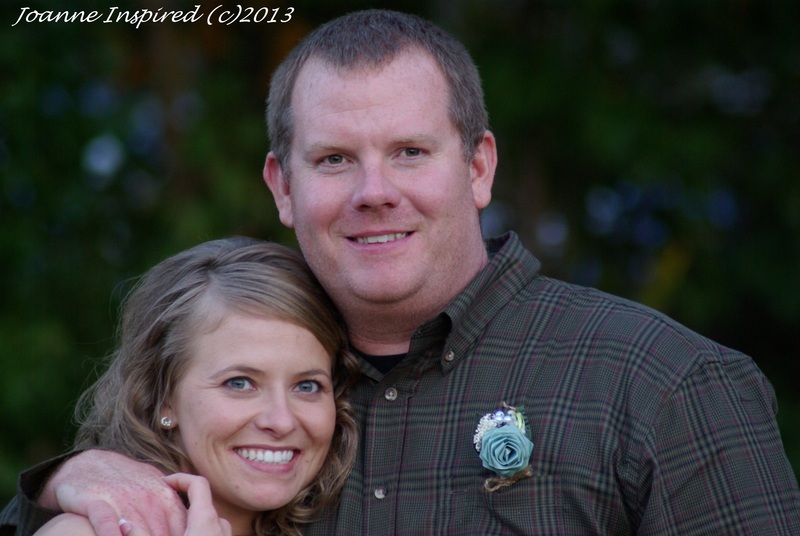 Print and frame an “I ♥ SPY” sign to leave next to the Guest Book table. This fun sign asks guests to take photos with their cameras, mobiles, iPads, etc. 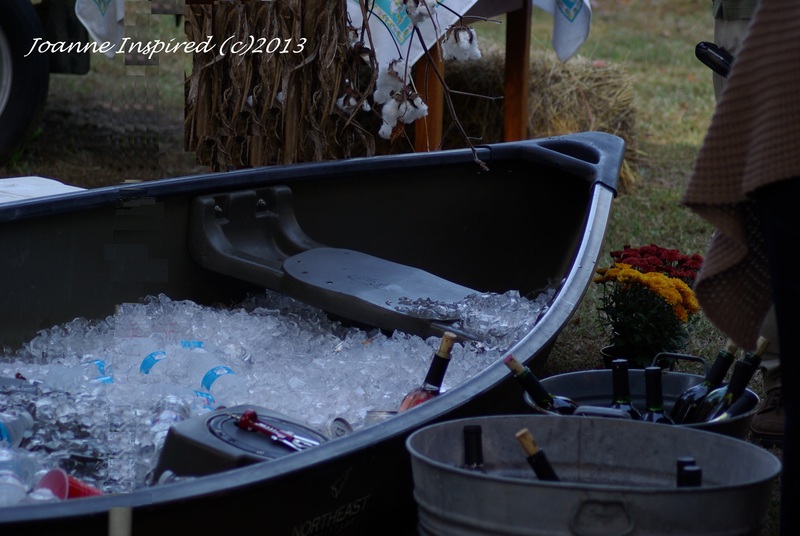 We left a small basket with the URL for our photo upload website. The kids had great fun using the Morale, Welfare & Recreation bounce house and playing in the sandbox and getting their face’s painted by older cousins. 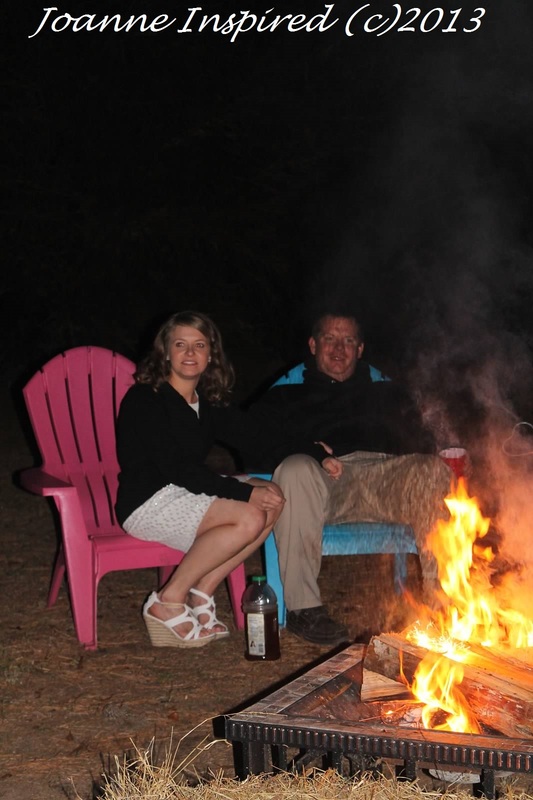 Adults played horseshoes and sat around the fire pit. Setup horseshoes and/or corn hole games. Create a kid’s paly area: sandbox and shovels, bubbles, face paint, crafts, etc. Setup a fire pit and pass out heart-shaped sparklers. (Adult supervison needed). 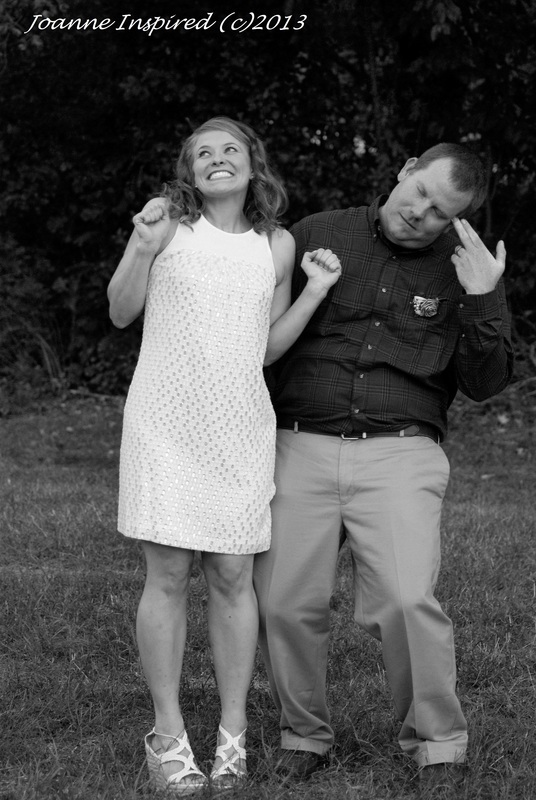 It can be expensive, but sometmes you can find a Groupon deal for photo booths. Find cheap costume ideas at thrift stores or go online to print out DIY props. 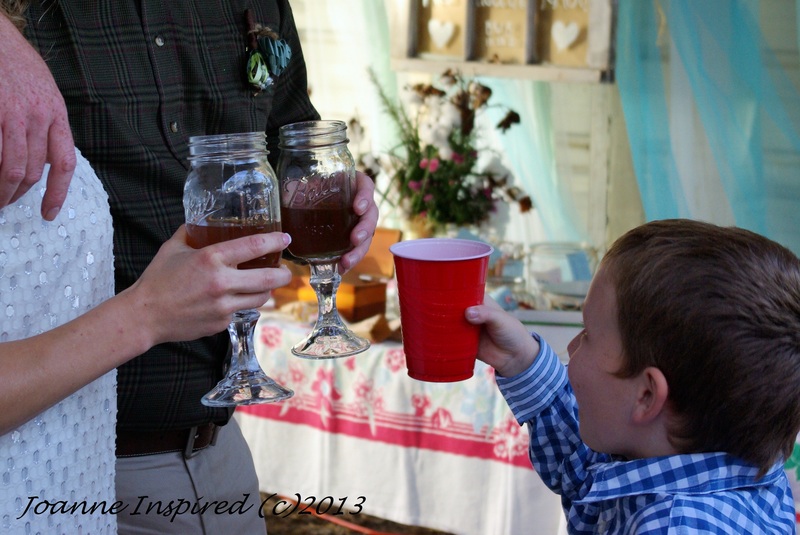 Guest Favors: Favors can really add very quickly! We bought new canning jars from the hardware store, not sure what we were going to put in them. An aunt and uncle saved the day by suggesting home made applesauce. 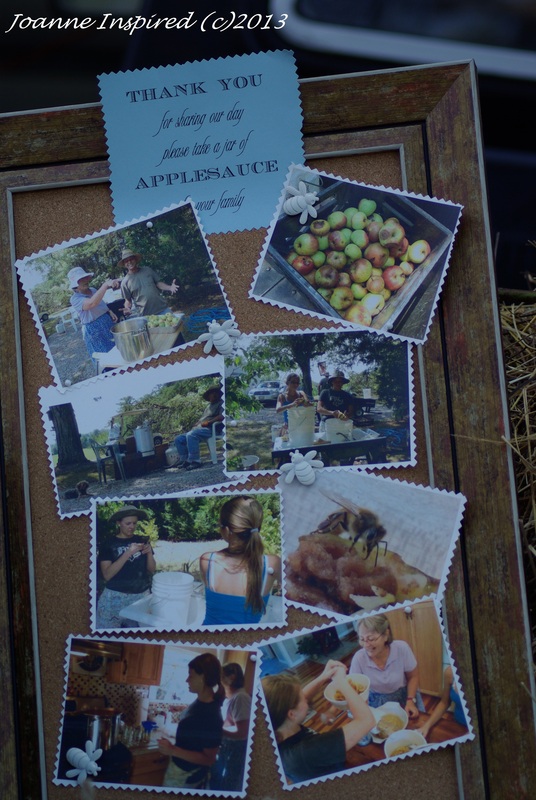 We visited their small gentleman’s farm to spend the day picking, washing, paring, cooking and caning yummy applesauce. 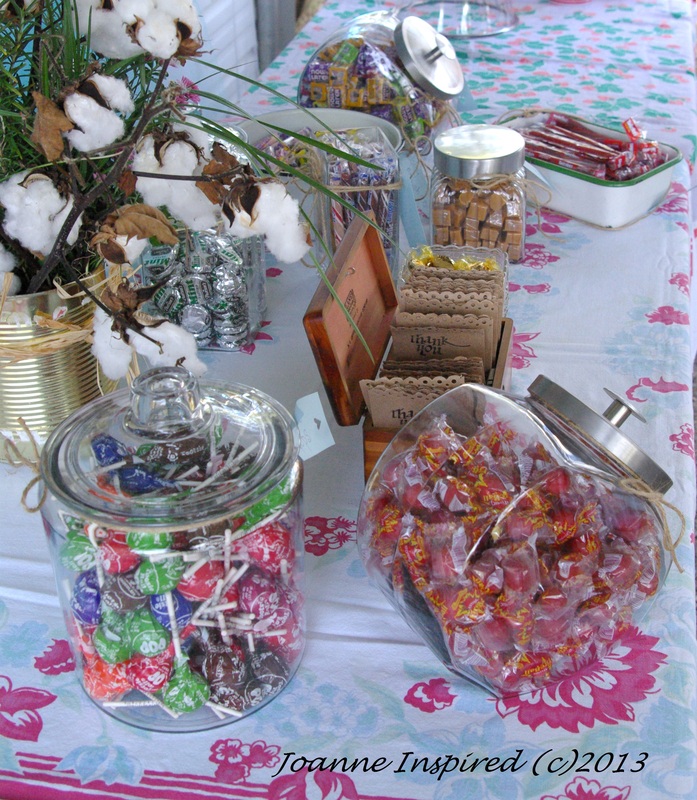 We covered the jars with printed cotton fabrics, tied with twine. 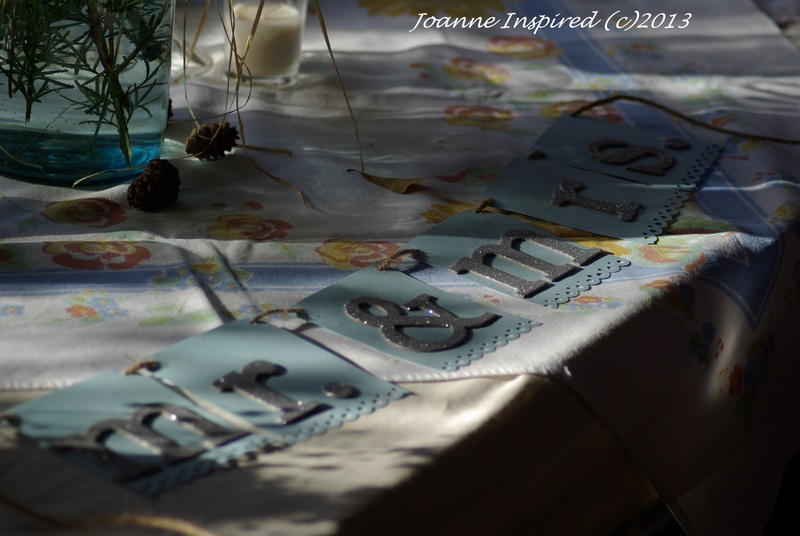 An added touch was hand crafted thank you tags. 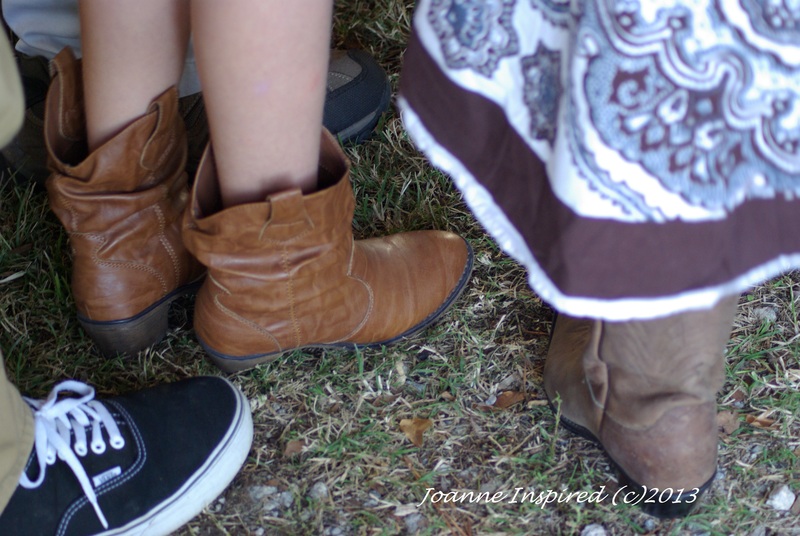 We chronicled our day and posted photos of our visit to Aunt and Uncle’s farm. Fill small canning jars with M & M candies, potpourri bought in bulk from a craft supply store, a votive placed in sand, homemade cookie or cocoa mix. The ideas are endless. Thank you tags can be home made. Buy small tags, a stamp pad and a “thank you” stamp, or use a small heart-shaped hole punch to add flair, or use twine to secure the tag to the favor. Again, the ideas are endless. 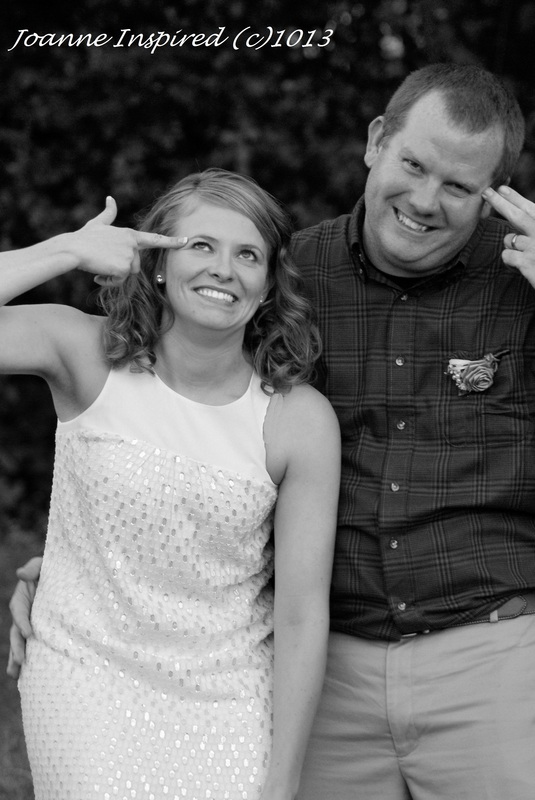 So, YES, a DIY WEDDING is a LOT of WORK! But, WELL WORTH the time and effort DIY takes! …AND…most importantly, work with what you have, borrow if possible, make a trade, be willing to compromise. Chances are that a compromise will save you money and NO ONE will even notice!